A few weeks ago I met David Gelsthorpe, Curator of Earth Science Collections at Manchester Museum, and we discussed a broad range of topics relating to engagement, representations of time, climate change and positive action. I always greatly appreciate the opportunity to consider possibilities and lines of inquiry in my research from a different perspective, and from within a very different specialism. 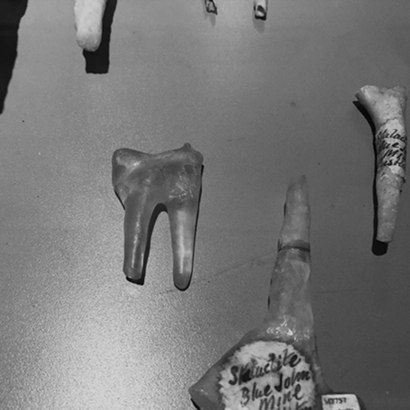 Museology as a ‘lens’ for representation is quite an established thread in my work and recently I have been reconsidering the effectiveness of that, my use of that, in the past and how I could utilise this again. David provided valuable insight and offered numerous viewpoints which I continue to reflect on moving forward. The following is a transcript of our conversation. M: In the museum setting, how important is narrative in encouraging audiences to position themselves within the context of, for example, geologic time? D: I think that narrative is absolutely essential because I think geologic time particularly is a very hard concept for people to understand. I find it quite interesting in terms of climate change and geologies because climate change has always happened - it always will happen, it’s an entirely normal and natural thing. M: But do we subdue it? D: Yes, I think that’s a good point because, sometimes, in the context of for example the work we’ve been doing around action on climate change, it’s almost a confusing narrative for the public, because if people get the strong message that climate change has always happened and always will, then people could see it as being a helpless thing. I always heavily qualify climate change narratives with human induced carbon dioxide levels and the massive changes on a geological time scale, which happens pretty slowly generally, but climate change in the last hundred, hundred and fifty years is astronomical. Saying that, there is some reasonably good evidence that in the last Ice Age, particularly from dating different fossils in our collection, for example in bones, that some of the changes were quite extreme and quite quick. From dating bone specimens such as from Hippo from North African type climates and Woolly Rhinoceros for example, some of the major climate changes from those extremes were probably several hundred years, and that is almost a lifetime isn’t it?! And that’s not so radically different to what’s happening now, but now it’s very very clearly manmade, and there are massive consequences to what is happening. So trying to help empower people to act positively is important. M: Thinking politically on some level, the museum has a voice as an authority doesn’t it, and so does that translate to an exciting position for you to be in here? D: Absolutely. Basically, we feel very strongly that there are so many public institutions that have a very heavily eroded level of trust – the NHS, the government… so we feel that we’re a very trusted organisation and that people identify strongly with us, and trust us to give them the ‘facts’, in inverted commas, and positive interpretations. We’re very conscious of that and don’t ever want to be in breach of that trust. We try to provide a really safe and balanced space as well, in which people can disagree with us, and we are totally okay with that. M: We were talking about the power of conversation, and there are so many museum spaces I feel that do not enable conversation in the same way as Manchester does… in terms of a different type of space – the art gallery, there is obviously quite often the element of the uncomfortable or the impenetrable which the public invariably struggle with, and maybe some of those conversations that could happen remain internal because of the pressure of the space. 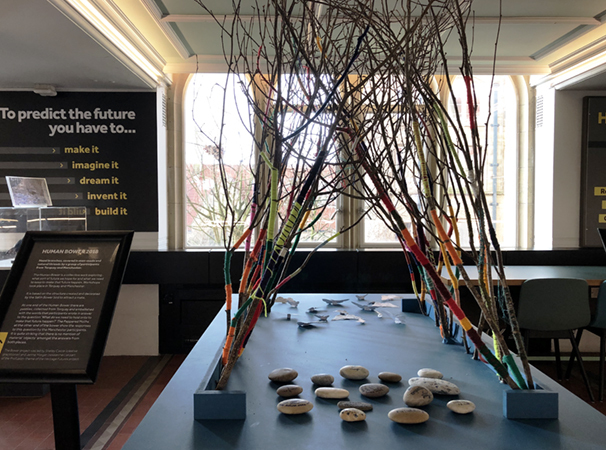 What you have with the Natural History collections in the Living Worlds space here seems to be something which bridges display, and objects, with issues and contexts in a multitude of engaging ways. D: That kind of makes me think about the question of ‘who has the answers?’. For example, in terms of our exhibition on climate control, we very specifically said ‘we do not have all the answers – what action on climate change would you like to take?’, and we had a lot of responses from visitors that were entirely unprompted, which was brilliant. Equally we had a lot of feedback from visitors who had been telling us they want to do great things about climate change but were overwhelmed and would appreciate some guidance on what they could do to make a difference. In the Living Worlds gallery downstairs we still have the display ten ways to make a difference, which includes a lot of things people have generally heard about already but another thing we looked at were the values we share as well. So, with climate change particularly there is a lot of research which points towards people feeling that they do great things and are ‘doing their best’ but nobody else cares, and actually we are trying to devise a way which shows that other people share your values. With ten ways to make a difference we had sweet jars and we had recycled bits of plastic that you voted into these sweet jars. With each one there was ‘yes I want to do more of that’, or ‘no, it’s not for me’, and the idea was that, with the votes saying ‘yes I want to do more of that’ you could suggest ways forward. It’s quite a false environment being in the museum in lots of ways, but people love it and keep coming back, and we get so much feedback when, for example we are doing work on the galleries and renovations people will ask ‘you’re not taking that away are you?!’. The mammals gallery used to be very 1970’s – a very of-its-time undergraduate display and you can’t really imagine why anybody would want to keep that, but for example lots of people really loved the polar bear! M: I must admit I’m a real sucker for that as well. The last time I visited the comparative anatomy gallery at the Jardin des Plantes, which is basically the old Great Chain of Being style display which seems very impenetrable in terms of language – there seemed to be almost no attempt there to tease out any kind of dialogue or question from the collection and the context of the arrangement; it did literally seem like a dead space in a lot of ways and seemed very static and fixed. Which in itself of course is fascinating and has its properties. D: I think we tend to approach from the perspective that we have an incredible building here from 1888, and I guess there are two ways you can see that – we try to see it as something which nobody else has got – very atmospheric, beautiful and a phenomenal backdrop to work on. Or you could see it in the other direction of all the cases being listed so we can’t do an awful lot to them or with them! It’s never going to be a white cube space. We can’t have a Brontosaurus in our space for example! But we’ve absolutely tried to play on our heritage as something that’s an absolute treasure, and our objects play a similar role in that – the key ones in terms of popularity I guess now would include the T-Rex even though we only got him in 2006, but you can’t possibly imagine that space without him in it now. It’s interesting how things evolve in that sense. M: This makes me think about the relationships between funding and engagement with the big charismatic pieces. The Natural History Museum had its Diplodocus and the dinosaur exhibit is still such a big sensational selling point… a lot of those people might visit and take away that they’ve seen big dinosaur models but what is embedded in terms of knowledge or the present? A very different experience to that might be that in terms of the Holderness coastline every now and again when I’ve read about the geological history of the area or visited museum collections, I‘ve seen examples of Woolly Rhino teeth or Ice Age animal remains from the area, or even just online or in the local news… someone has been down to the beach and pulled a tiny Ichthyosaur vertebrae or part of a fin or something out of the cliff and this happens a lot and that opens up questions I suppose about why they aren’t there anymore – ‘that’s an amazing thing that I’m holding but that isn’t there any more’… or is it? Just transformed? D: With Ice Age animals for example, they are categorised as sub-fossil bone, so they are half way between being the original animal and the fossil. Half-way between the bone being replaced by mineral content. I always find it quite interesting that when you take it out the ground, to stop it from being destroyed, you’re also stopping the geological fossilisation process – almost halting it’s potential in some way. M: I’m interested in that within my practice and my research – looking at absence or ‘fixedness’ and trying to draw parallels between geology and memory loss. Most of my grandparents suffered from degenerative neurological diseases and witnessing those things as a young person aren’t necessarily unique or unusual, for a child to lose a grandparent, but there is something I’m trying to explore there on some kind of poetic or experiential level about erosion and transformation. What you are describing about retrieving things from the ground and ‘fixing’ them in the process is similar maybe to the ways in which we encode memory; encoding, consolidation, retrieval. These are very broad ideas to unravel! D: I think thats maybe right. I think one of the key problems we have when we’re talking about rising sea levels et cetera… Manchester for example: currently it’s looking like it might be a few degrees warmer maybe but the feeling is that we’re safe, or even that those differences are desirable – the reality of course is that there could be thousands of refugees, we could be struggling to get certain types of foods… to take it back to the exhibition we did on climate change, in the case of our brilliant front-of-house staff, they took quite a lot of ownership of the public workshops we ran, they devised flashcards as a way of talking to people and asking questions, and we had items for example like a model of a Manchester tram driving through the snow to get people thinking about the idea that we might not be able to get work. We are just trying to think about some of the smaller or more subtle ways in I guess. M: Maybe the places that we read about this happening can also be very potent politically and the challenge is to keep the critical mind open. In terms of migration, you mentioned refugees – I have this fascination with historical migration in particular as regards the last Ice Age and conceptions of Doggerland’s submergence – the implications this would have had on our distant ancestors and the idea that our island isn’t a fixed shape. Im not entirely sure we are all familiar with the reality of what it might be like to be a climate refugee today or are even vaguely presented with objective information on how immigration actually works. If our institutions and our media and our education systems aren’t adequately explaining without political agenda or bias why immigration might be occurring in and from certain areas in a more accelerated fashion then we’re left to make judgements, maybe treating people as numbers possibly rather than in a humanitarian way – the rightwing press in my opinion has an awful lot to do with this. There is something very strange about this because at least in my mind if I think about migration its nature is as a very human or a very ‘natural’ phenomenon which adapts to pressures and changes over time and is not some huge threatening and fearsome set of behaviours. D: I think the key is having something people can relate to in terms of how to intervene and engage with reality. It’s also interesting thinking about the last Ice Age in terms of what exotic animals we did or didn’t have in Britain at different times, and its migration in and out of Britain rather than localised extinctions that shaped our landscape then to a large extent. Something which struck me a few years ago when I was working on a research paper was that even though we talk about a land bridge between Britain and Europe we tend to make it sound much more simple than it really was – there would have been really massive substantial rivers that created boundaries which animals like Giant Elk could obviously swim across, but it wasn’t as casual as maybe the images in our minds would lead us to believe. Presumably the people of the last Ice Age would have found it quite traumatic if they managed to settle in a place with access to hunting and a degree of relative safety, and they gradually found that life was getting harder and harder, and actually people can relate to that. M: That sounds very present! D: Yes it does – absolutely. And no doubt there were people migrating elsewhere all the time and simply couldn’t survive. You’re right that I think it’s saturation point in terms of information, that it’s too much and you just switch off, but actually some of the interesting conversations we had around the climate change exhibition were about us not overwhelming people with facts and leaving people depressed, and feeling unable to act… actually we came to conclusion that it was okay to make people aware of realities and possibly even a little bit depressed as long as you give them the tools to deal with it, and the means to actually do something about it, a strong sense that other people you care and have shared values. It’s something that we can influence positively. For us here as a museum, if we’re not meaningful and relevant to people visiting here then we are not going to get funding and we don’t have a future as an organisation. If we’re irrelevant and unpopular then we cannot exist. People will not come here if we do not care about relevant issues. M: What does the future look like? D: The future is an exciting place where things can be quite amazing. I think the future looks like something we can shape. I don’t think that we are victim of where things are now and where they are going. I don’t think a lot of people think that necessarily. There’s sometimes a feeling amongst people that things are only ever getting progressively worse, and it will be worse for our grandchildren, but that doesn’t have to be the case.